May 31 is National Macaroon Day. The small unleavened cakes with crispy crust and soft and chewy center are considered as the best French dessert ever. Although macaroon is a French dessert, it originated in Italy. The most common belief is that Italian monks modeled macaroons after their belly buttons. The name for the dessert derived from “ammaccare” that means to crush (with reference to the crushed almonds or almond paste, a principle ingredient). Macaroons were brought to France in 1533 by the pastry chefs of Catherine de Medici. The dessert was perfected to what we know today. Later French macaroons were adopted by Italian Jews, who brought the recipe to the USA. As far as almond macaroons are very fragile and hard to make, almonds were substituted with coconut. Today coconut macaroons are most commonly found in the USA. Coconut is sometimes substituted with cashews, pecans and, of course, almonds. 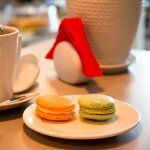 No matter what variety of macaroon you prefer, it's perfect with a cup of good tea.